Prehistoric Murals, Ardeche, France: Discovery, Significance, Cave Layout. dating to about 30,000 BCE. Some of the world's oldest art. Cave painting from Chauvet Cave. after the Abri Castanet engravings. 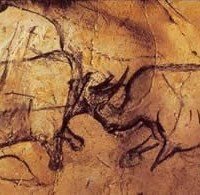  Carbon-Dating: How Old are the Cave Paintings at Chauvet?  What is the Significance of Chauvet Cave and its Art? For the 100 earliest artworks, see: Oldest Stone Age Art. The Chauvet-Pont-d'Arc cave - among the world's oldest sites of prehistoric cave painting, along with the El Castillo Cave Paintings (39,000 BCE), the Sulawesi Cave Art (37,900 BCE) and the abstract signs found at Altamira (c.34,000 BCE) - was discovered quite by chance in the Ardeche gorge in 1994, by three speleologists - Jean-Marie Chauvet, Eliette Brunel-Deschamps and Christian Hillaire - while they were surveying another cave nearby. Inside the Chauvet grotto, they found a 400-metre long network of galleries and rooms, covered in rock art and petroglyphs, whose floor was littered with a variety of paleontological remains, including the skulls of bears and two wolves. Some of these bones had been arranged in special position by the previous human inhabitants. Amazingly, Chauvet's entire labyrinth of prehistoric art had been left undisturbed since a landslide sealed off the entrance about 25,000 years ago. Carbon Dating: How Old are the Cave Paintings at Chauvet? What is the Significance of Chauvet Cave and its Art? The discovery of the Chauvet cave, along with its galleries of prehistoric drawings, paintings and petroglyphs, was significant for two main reasons. First, both the content of the imagery and the artistic techniques used to create them, came as a major surprise. The types of animals represented was unusual, because previously most of the species depicted in Stone Age art were game animals that were hunted for food. However, at Chauvet, it is the more dangerous animals - not generally hunted for food - that account for a majority of the images. Furthermore, Chauvet's Stone Age painters employed more sophisticated techniques of drawing, shading, perspective and composition in their murals than was previously expected, at least for the period in question. As a result, Chauvet contains numerous dynamic and powerful compositions consisting of multiple images skillfully executed and arranged to fit in with the contours of the cave chambers. There is also some evidence to suggest that a significant quantity of the charcoal drawings were painted by a single, master artist. Until the discovery of Chauvet in 1994, most paleoanthropologists believed that the major centres of parietal art were confined to the Perigord-Quercy region, the Pyrenees, and the Cantabrian coast. The discovery of the Chauvet-Pont-d'Arc cave in the Ardeche region, reminds us that original caves of great cultural importance might still await discovery in areas other than the major centres. Note: For a comparison with African painting from the same era, please see the animal pictures on the Apollo 11 Cave Stones (c.25,500 BCE). Chauvet also sheds an interesting light on the artistic inventiveness of Aurignacian art (c.40,000-26,000 BCE). Ever since the 1930s, researchers have known that between 35,000 and 30,000 years ago the Aurignacians living in the Swabian Jura of southwestern Germany carved beautiful ivory statuettes - such as the peculiar Lion Man of Hohlenstein Stadel (c.38,000 BCE) - with both naturalistic and stylized characteristics. (For more details, see: Ivory Carvings of the Swabian Jura.) 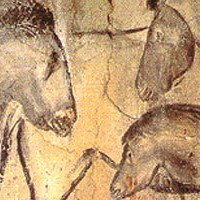 The unusually sophisticated cave art at Chauvet, a site contemporary with the Swabian ivories, demonstrates that the Aurignacians were equally talented at painting and engraving than they were at prehistoric sculpture. At the same time it raises an intriguing question: given the identical subject matter (mammoths, felines, bears, bison, horses and rhinoceroses) between Chauvet's painting and the Swabian ivory carving, was there a direct relationship between southern Germany and the French Ardeche region, (say) via the Rhine and Rhone valleys? Or is this artistic congruence between the two areas mere coincidence. Whatever the answer, let us hope that further examples of Aurignacian artistry emerge before too long. The gorges in Ardeche contain numerous caverns, many of which possess petroglyphs and other artifacts of archeological and geological significance. But Chauvet Cave is unusually big and was inhabited by prehistoric humans during two distinct periods: the Aurignacian (c.40,000-26,000 BCE) and the Gravettian (26,000-20,000 BCE): that is, firstly about 31,000-29,000 BCE, and later about 26,000 BCE, after which the cave was sealed by a landslide. Most of the artwork dates to the earlier period of inhabitation (c. 30,000 BCE). For information about another prehistoric cave in the Ardeche gorge, see: Grotte des Deux-Ouvertures /Cave of Two Openings. Chauvet contains a total of over 300 paintings and engravings. These were grouped in specific ways. In the most accessible part of the cave, most images are red, with a few black or engraved ones. In the deeper part, the animals are mostly black, with far fewer rock engravings and red figures. Also, there are groupings of specific animals: for example, the Horse Panel and the Panel of Lions and Rhinoceroses. 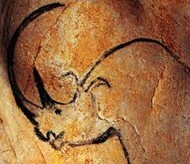 What makes Chauvet such an important example of Franco-Cantabrian cave art, is the sophistication of its paintings. No other Aurignacian cave contains compositions with the same degree of realism, naturalism and complexity. The most noticeable animals in the cave (accounting for some 60 percent of all such images) are lions, mammoths, and rhinoceroses, all of whom were rarely hunted, thus unlike most other caves, Chauvet is not a pictorial showcase of daily Stone Age life. Other rare animals include a panther, a spotted leopard and an owl. In addition, the cave features the usual horses, bison, aurochs, ibex, reindeer, red deer and musk-oxen. As well as figurative pictures, Chauvet contains an abundance of abstract art in the form of geometric symbols (though less than sites in the Cantabrian region of Spain), a number of indecipherable marks, as well as a quantity of red-ochre prehistoric hand stencils and handprints. According to researchers, the workmanship of Chauvet's prehistoric artists is excellent. Shading, perspective and relief are skillfully used, the body proportions of the animals are natural, and species are clearly defined with numerous details of anatomy shown: for example, mammoths are drawn with an arched belly, bison are presented in frontal perspective with a bushy mane, horses too have thick manes, while the rhinoceroses have very distinctive ears. Chauvet's Stone Age painters also used engraving techniques to emphasize the lines, volume and relief of the animal figures, and mixed floor clay with charcoal to create different hues. See: Prehistoric Colour palette. The Chauvet-Pont-d'Arc cave runs for about 400 metres in a north-south direction. Its entrance leads into the Brunel Chamber. This has five areas or panels of parietal art. Near the original prehistoric entrance is the "Vestibule of Red Bears", in which there are three red drawings of cave bears - recognizable by the steep incline of their foreheads - on a panel in a small recess. The central bear has been drawn with a confident hand using the natural contour of the cave wall. This bear is complete, but the one to its left consists of just a bear head, while to the right the third bear is part-complete. The painter used a technique known as stump-drawing - the use of fingers or a piece of hide to shade the inside of the bodies and add volume. Also near the entrance in a small recessed niche, is the Dotted Animal Panel marked by a group of red dots applied with the palm of a hand. The dots may depict a mammoth. The Brunel Chamber also contains the Panel of the Sacred Heart with its mysterious sign of the cross, the only known example in Paleolithic culture. Another feature is the so-called Wall of Dominos, home to one black painting of a feline in profile. Close by, there are a few red dots and the rear of an animal (possibly an ibex). The Brunel Chamber also contains the Alcove of Yellow Horses, fronted by a hanging rock decorated with dots of red ochre. The facing wall is marked with numerous small figures. This long chamber which leads into the heart of the cave complex was kept deliberately bare and has no drawings or paintings, except for a single Rhinoceros head at the very end. At the end of the Chamber of the Bear Hollows, to the east, stands the Cactus Gallery, whose walls are marked by layers of solidified sedimentary rock. A striking red bear, similar to those in the Vestibule of Red Bears in the Brunel Chamber, is on one of the walls, and a number of altered paintings appear elsewhere in the gallery. The Gallery of Hands contains the Panel of the Panther - a somewhat unusual name given that its principal animal has a spotted coat more reminiscent of a Hyena, and a shape more like that of a bear. There is also a large bear, an ibex, a small vertical bear, and an acephalous ibex. The figures are all painted in red. In addition, there is the Panel of Red Signs, containing numerous mysterious markings, and the Frieze of Red Rhinoceroses. Underneath, several other animals are also painted in red, including a mammoth, felines and yet more rhinos. On the wall nearby, a number of hand prints can be seen, plus one hand stencil. The latter, together with the partial outline of a black mammoth, is located on the Panel of Hand Stencils. A low passage - known as the Candle Gallery - with no paintings but some charcoal and torch marks, connects The Gallery of Hands with the Hillaire Chamber. From now on the Stone Age art becomes more monumental. This chamber contains a large number of individual animal pictures and several major animal groups. The Panel of the Engraved Horse depicts a horse walking to the left. Created with the same finger-tracing method of painting as the nearby owl image, the Horse is a partial representation, with a full mane and a hairy chest, but with legs tapering into abstract lines. On a separate surface there is a rather strange painting of an owl, whose head is seen from the front while its body is seen from the back. The bird was engraved on the soft outer layer of the cave wall after the surface had been scraped clean. On the north wall of the Hillaire Chamber, which leads into the smaller Megaceros Gallery, there is a panoramic display of painting, which consists of several independent panels. The entire mural is about 7 metres in length and is considered by art critics to be one of the most important galleries in the cave. This panel extends for several metres. Before being painted the wall was carefully scraped, erasing several initial drawings in the process. Some 20 images were then depicted on the panel, starting with a dramatic pair of rhinoceroses confronting each other face to face. These two charcoal drawings have been dated to about 30,000 BCE. After this, the heads of four horses were added, along with other animals. Slightly different hues were obtained by mixing the charcoal with floor. Other techniques of drawing, shading and perspective were also employed. This houses three horses, whose heads are emphasized by shading. These equine images are connected by lines to a large lion. To the right, a bison is seen in profile, facing right. The double lines of the back, the hindquarters and the feet were probably intended to create the illusion of movement, or the perspective of two animals standing side by side. Three other panels appear by the north wall of the Hillaire Chamber: the Panel of the Cervids (prehistoric deer), featuring a number of oxen, bison, horses, and deer; the Panel of the Rhinoceros, which depicts a single complete rhinoceros underneath the dorsal outline of another; and the Panel of the Megaceros (an extinct type of giant moose), which features the profile of a rhinoceros. Off to the west is the Chamber of the Skull, which is noted for its hanging rock embellished with black drawings and engravings of reindeer and other creatures. The roof of the cavern is marked by numerous folds and recesses many of which contain charcoal drawings and engravings. This gallery is situated in the extreme north-west corner of the cave complex. It is famous for its human footprint (left foot), similar to that of a male person about 4.5 feet tall and around 9 years old. The footprint is the first of a trail of prints extending some 160-feet in length. Connecting the Hillaire Chamber with the north-east inner recesses of the cave, is the Megaceros Gallery. Nearly all of this passageway was left undecorated. This is the deepest part of the Chauvet cave complex, and occupies the extreme north-east corner. It boasts several areas of artistic interest. The first is the Panel of Feline profiles, consisting of two life-size charcoal outlines of a pair of lions, side by side. The male lion appears in the background; the female in the foreground. Given the relatively large scale of the images, the artist must have had enormous faith in his drawing ability. On a pillar facing the entrance of the End Chamber is a set of images depicting several black bison, whose outlines are enhanced with both shadings and engravings. Dated to about 29,000 BCE, the panel also includes an engraving of a partial mammoth. This engraving was made before the black drawings. For some reason, pictures of bison were only painted in the deepest parts of the cave. The large west wall of the chamber is adorned with a series of important panels arranged around a niche. As elsewhere, the wall surface was scraped clean before the artist began. The niche, known as the Niche of the Horse, is painted with a single image of a horse, whose tail is drawn into a recess in the rock. The effect of this, is that the animal appears to be emerging from out of the rock, as if by magic. This composition - above and to the left of the niche - is set against a backdrop of large feline figures. All in all, it is a most unusual example of parietal art. Not only is it unusual to see so many rhinos represented - they were a comparatively rare species at the time - but the way they are grouped and laid out is also very unusual. This group of animals - set above and to the right of the niche - are also shown in perspective, and the prehistoric artist has adeptly used the natural contours of the cave wall to separate the different elements of the picture. The painting depicts a hunt. To the left, there are four bison heads, and two rhinos; in the centre and right there are seven bison, pursued by a group of sixteen lions, most of them represented by their heads alone. At the extreme end of the End Chamber a rock formation hangs down from the ceiling to a point about 3-feet off the ground. This rock formation is adorned with a mass of charcoal drawings and engravings: one horse, two mammoths, four lions, one musk ox, plus a hybrid figure - half man and half bison - known as the Sorcerer. Next to it is the front view of a woman's pelvis joined to long tapering legs. Her pubic triangle and genitalia are clearly visible. The figure of the Sorcerer wraps around and faces the pubic triangle. This powerful fertility image, not unlike the venus figurines - such as the Venus of Hohle Fels (c.38-33,000 BCE), the Venus of Dolni Vestonice (26,000 - 24,000 BCE), or the The Venus of Willendorf (25,000 BCE) - is yet another link between the art of the Ardeche and that of the Swabian Jura. Latterly, researchers have uncovered a new chamber, named the Sacristy. Accessible via a small corridor in the rear left side of the End Chamber, it features a crayon drawing of a small mammoth, whose tusks are emphasized by engraving. The drawing is as yet undated. In general, although most archeologists recognize the importance of cave painting to Paleolithic art and culture, they are still unsure as to the specific purpose of the caves themselves. One popular theory - based on the subject matter of the paintings, and the fact that Chauvet, like most caves, was not used as a place of regular habitation - is that it functioned as a centre of ritual or magical ceremony. That is to say, the images were intended essentially for the spirits - the primitive beings or deities worshipped by Prehistoric Man - not for other men. Of course some or all of the images might have been revealed to certain individuals, but they were really meant for the spirits. It was their existence that mattered, not their public display. What we can say, is that while Chauvet doesn't contain the earliest art of prehistory, it does house the earliest cave murals and exemplifies the rising cultural level of Aurignacian man during the last period of the Stone Age. Renowned for its emotive collection of mutilated handprints. Important cave, noted for its "Bison frieze" and "Licking Reindeer". Contains an outstanding limestone frieze of relief sculpture.  For more history and facts about paleolithic cave painting, see: Homepage.